The general opinion on the Valencia GP is that it was monumentally boring. Not even the pit stops managed to produce any significant changes in the race order and the race amounted to a procession with gradually-widening gaps between each car. I tend to agree with Keith Collantine when he says that we should blame the rules, not the track, for such an uneventful race. Practice and qualifying in Valencia were exciting enough to raise our hopes for a great race, and that made our disappointment even harder to take. It has to be admitted that the qualifying system has always encouraged races without overtaking. We separate the cars into order of lap times, putting the fastest in front. Assuming that everyone puts in a reasonably representative lap and that weather or luck do not intervene, the ensuing race should, theoretically, be processional with gaps between the cars slowly increasing. In spite of our memories of great races of long ago, the majority of GPs have always been a bit predictable. What made that bearable in those days was the massive influence of unreliability of the cars. Had Jim Clark's Lotus been as reliable as it was quick, the mid-sixties would have been a complete borefest with the gifted Scot winning race after race and the championship his long before the end of each season. The theory is not perfect, of course, and very often some cars prove to be quicker or slower in the race than their qualifying times would indicate. With the incredible reliability of F1 engines today, we should, were everything else equal, have some exciting races and plenty of overtaking. It does not happen that way because aerodynamics has become so huge an influence on the cars' performance. A driver can catch the car in front but, at a certain distance, his car's aerodynamics begin to suffer in the wake of his competitor. He is forced to slow, therefore, and the gap remains consistent throughout the rest of the race. That is exactly what happened in Valencia. Qualifying had done a rather better job than usual and the cars were very much in their correct positions. Without a first lap incident to shuffle the order, the inevitable ensued - a high speed parade of the most advanced racing machines designed so far. It is ironic that this should have happened at a time when the cars are so closely matched that grid positions are decided by a few thousandths of a second. We talk of the Force Indias being slow but the reality is that they are within two seconds of the fastest lap time. That is an age in F1 but very little visually. Decades ago, times were measured to tenths of a second - no finer precision was needed because the difference in performance of the cars was so much greater. It is also true, however, that the driver was more important then, a great driver being able to make up for deficiencies of his car and produce surprise results. In those days, too, if a driver was able to catch the car in front, his greater speed would also enable him to pass. 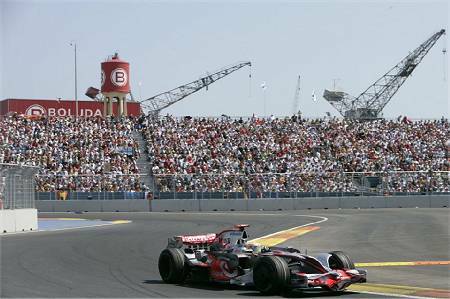 The Valencia circuit has been the victim of modern F1 car design, therefore. Had the circuit appeared in the sixties, there can be little doubt that it would have produced some classic races. A touch of rain or a safety car period might also have worked wonders. So we should not despair and classify the track as yet another Barcelona or Hungaroring; I am sure that it has the potential to produce wonderful races in the future. Should the new regulations due to take effect in 2009 have the desired effect, it is very likely that Valencia will become one of the much-anticipated highlights of the year. And now we can sit back and wait those few days until the greatest of them all takes place. Ah, Spa-Francorchamps, where would we be without you? Something that I was wondering, Clive, is how the state of Formula 1, this lack of “actions” and entertainment, has shape the Hermann Tilke´s approach on his Formula 1´s work. You are correct in thinking that Tilke is not entirely responsible for the unimaginative layout of his tracks, Becken. His problem is that he has to stay within the FIA's limits on maximum gradients allowed, radius on corners and so on. Were the older circuits subject to such stringent rules, many of them would have to be altered or outlawed. The wonder is that Tilke managed to produce as good a circuit as Turkey in spite of all the limits imposed upon him. Once again, it seems that the FIA are at the heart of the problem. I think one of the problems Tilke faces is that so many of the locations he is given are flat. The great circuits always followed the terrain. There is only so much you can do with a piece of flat ground. Imagine Eau Rouge if it was flat. Steven: Agreed that Tilke has had some very dull and flat places to design circuits for. Considering the huge amounts expended on track-building, however, I sometimes wonder whether he might be advised to spend a few more million dollars and indulge in some gradient creation. Easy enough to bulldoze a big hole here and there and then use the soil (or sand) to create a hill elsewhere. Andrew: Yes, Kimi must be desperate to put some good results on the board by now! Architrion: You could be right but, fortunately, Spa's weather is so unpredictable that the chances are high of there being rain at some time during the weekend. And we all know what rain can do to a race! How sad to have to hope for rain to make a race interesting and exciting. True, Don. It's the way things are in F1 at the moment, however. We've been lucky that so many races this year have been affected by weather.